TADHack Global will run in parallel across 30+ cities around the world. To win prizes is simple: create hacks using the global sponsors’ resources. We also have some development themes this year to encourage hacks in particular topics, such as BOTs, AI, IoT, Enterprise Communications, NFV, and open source contributions. Find a location close to you and register, or you can take part remotely. This year, we will have an inspirational keynote video message from Mark Shuttleworth, Founder of Canonical at the start of the hackathon in every location. 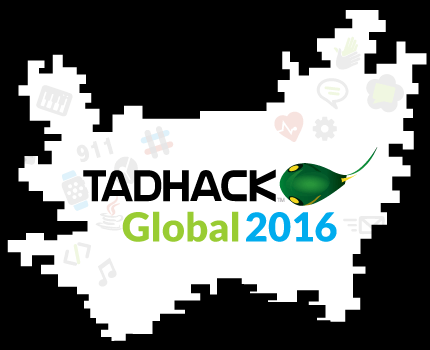 TADHack Global 2016 had over 2600 registrations, and over 170 hacks. A big thank you to everyone who took part in TADHack Global, to the many partners running locations around the world, and foremost to our Global Sponsors who made TADHack Global 2016 possible: Carrefour, Canonical / Ubuntu, Cisco Spark, hSenid Mobile, Matrix, Project reThink, Telestax, Tropo, and VoxImplant. We had so many world-class hacks and our judges had an exceptionally hard time deciding the winners. You can read about the winners or review the event through our media links above. And please grow the friendships you built over an extremely intense weekend!